The Honor 8 costs the same as its closest rivals, the ZTE Axon 7 and OnePlus 3, and similarly only works on GSM carriers like AT&T and T-Mobile in the US. It's the prettier of the three, but the only one to start at 32GB instead of 64GB. It’s therefore automatically the third wheel due to its later launch date, smaller entry-level size and illogical software choices – like no app drawer. That’s okay, it does other things right. The Honor 8 thinks outside the box with inventive gesture shortcuts and a dual-rear camera for sharper than average photos on a mid-range phone. There’s also an IR blaster so your phone can become your TV remote, and a rear fingerprint sensor that can be customized with all sorts of single and double-tap shortcuts. 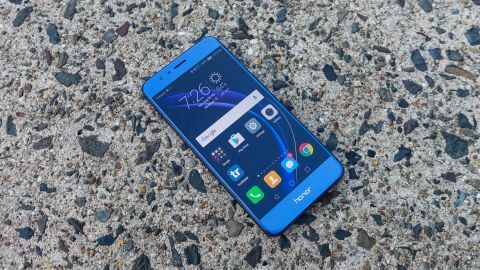 Honor 8 relies on these novel features to differentiate itself beyond its light-diffracting good looks and tempting price, to make a strong case for becoming your next shiny object. Who's this for and should I buy it? The Honor 8 is the perfect smartphone for anyone who wants a trendy-looking device, but doesn't want to break the bank. It's affordable and takes good selfies from the front-facing camera, making millennials the ideal buyers. Just don't expect it to be too water-resistant or play VR games. It's not that trendy. It's hard to find a better phone at this price range that's also suitable for one-handed operation. The ZTE Axon 7 is a close rival, but its 5.5-inch screen isn't going to appeal to the same crowd. You won’t find the Honor 8 in carrier stores in the US and you can’t buy it on a device payment plan. It’s available at full price through Best Buy, Amazon and Huawei, having launched in August 2016. It originally cost $399 in the US and £369 in the UK SIM-free with 32GB of storage. We've seen the price drop down to $350/£299 at different times of the year in the UK since the launch of the Honor 9. A 64GB configuration launched at $449 and is only sold in the US. The Honor 8 supports microSD cards and adoptable storage, though, so the lack of a 64GB option may not matter if you’re in the UK and need extra space down the road. The good news about paying full price is that it’s off-contract and completely unlocked. Be warned, though: this phone is only compatible with AT&T or T-Mobile nanoSIM cards in the US, not CDMA networks like Verizon and Sprint. The Honor 8 is the best-looking glass phone we've ever tested next to the Samsung Galaxy S7 Edge. That’s because it doesn’t just reflect like a mirror, it captures and diffuses light. Like moving spotlights at a Hollywood premier, this phone bounces long rays of light off its glass back and waves them back and forth as you move it. It’s a true showman in a world of pale-colored aluminum phones. This Aurora-inspired effect is accomplished with 15 layers of glass and nano-etched color filters that diffract light at different angles. Most glass phones have six to eight layers. With its glass design and bump-free camera, the Honor 8 is an incredibly slippery phone. Put it on what looks to be a flat train seat next to you and you’ll soon find out how truly horizontal that seat is (or isn’t). The Honor 8: part phone, part leveler tool. The good news is that despite its ultra-sleek glass body, the phone’s size is easy to handle at 146 x 71 x 7.45mm and a weight of 153g. You can operate it in one hand without discomfort. You really don’t want to have to resort to buying a case for this shimmering smartphone, which comes in Sapphire Blue, Pearl White or Midnight Black. Honor 8 doesn’t use Gorilla Glass, but a very similar Nippon Electric Glass. Using the phone without a case, we didn’t experience any damage or large scratches, just a faint blemish on the back when posing it on the sidewalk. Like the iPhone 7 in Jet Black, it's vulnerable to smaller micro-abrasions. The Honor 8 makes us proud to be holding a cheap Chinese phone in our hand. That doesn’t always happen with inexpensive Android phones. This one shines like a diamond. Where's that Android app drawer? Beyond the ‘oohs and ahhs’ that the ultra-reflective Honor 8 can draw, Huawei’s Android skin makes rather controversial changes to the user interface. Honor 8 runs Android 7.0 Nougat, but quit looking for the app drawer. It’s not here. Every app is on the home screen, as if this were iOS 10 instead of Android. Huawei, like a lot of Chinese phone makers, uses its own Android skin – EMUI 4.1 in this case – which doesn’t include a catch-all app drawer. It’s simplified, but starts out as an instant app explosion on the home screen when you transfer 100 apps from an old phone. It’s not the only way in which the Honor 8 echoes Apple. It takes cues from iOS 9 with an interface that splits its top-down notification shade into two segments, one tab for notifications and another dedicated to quick settings. Pulling down this menu and toggling between the two is a confusing extra step. Honor 8’s menu changes will go over well with anyone who appreciates its iPhone-like simplicity in terms of menus. Long-time Android users, though, may be turned off at first, until they install a third-party launcher that includes an app drawer. That’s the benefit of being able to tinker with Android. The rear fingerprint sensor doubles as a 'smart key'. Slide your finger down this rear scanner pad and it’ll lower that notification shade. Double-tap or triple-tap it and it can execute custom shortcut actions. We also got some use out of 'knock' gesture controls. With your knuckle, you can draw a C to open up the camera, E for opening Chrome, M for the Notepad and W for the weather – all of these default commands are customizable with different apps. There’s now also an easier way to take screenshots and record screencasts: just knock twice on the screen with one knuckle to snap a screencap. Use two knuckles to start and stop the screen-capturing video. One more neat trick: you can draw an S for a scrolling screenshot. You can go more than a day with the Honor 8 battery thanks to the fact that it has a 3,000mAh battery capacity and a lower-resolution display with fewer pixels firing all at once. That 5.2-inch 1080p display is the key this phone’s day-plus battery life, and we went a day-and-a-half with significant screen-on time before the battery gave out completely. How did it last so long? There are new battery manager tricks to eke out several extra hours of battery life from this phone. Different 'Power Plans' detail the exact number of minutes you can get at different performance levels. The last one on the list turns the Honor 8 into a very basic phone with big dialer, messaging and contacts buttons in black and white. Our battery life test involves running a looped HD video for 90 minutes, during which time the phone lost 20% of its fully charged battery. These better-than-average results, combined with battery life saving tricks, will give you more than a day of use. Charging the Honor 8 via its USB-C isn’t the fastest, with the phone taking 106 minutes to get from 0% to 100% using the included charger. It doesn't use Qualcomm's Quick Charge 3.0, so you can't rapidly charge it with non-Huawei chargers – it will just juice up at normal speeds. It’s not all bad news, though. We were able to reach 25% just 15 minutes into charging with the included Huawei charger, and that kept steady at 50% in 30 minutes. It’s just that the fast charging rate drops off every minute after that and adds up down the line. Even with its slower-than-average charging speeds and fussy fast-charging cable compatibility, the Honor 8's battery life is more than adequate for a full day. Just don’t forget your Huawei charger if you’re away from home longer than that. There’s a lot of emphasis on the Honor 8 camera because there are three: two lenses on back, one selfie camera in front and three reasons for Huawei to rave about them all – to a degree. The 12MP dual rear cameras don’t actually double photo quality, but they do take slightly better pictures than Honor 8’s closest mid-range smartphone rivals, the OnePlus 3 and ZTE Axon 7. It pairs two f/2.2 aperture cameras right next to each other in a bump-free design, and they're identical to the Huawei P9 cameras. One shoots rich color photos and the other snaps monochrome images. The combined photos provide more light and increased sharpness. Autofocus proved to be fast and accurate with this dual-camera setup, and you can adjust the bokeh in edit mode. Snap a photo and then blur backgrounds and foregrounds from f/0.95 to f/1. There’s a nice distinction between focus points and plenty of layers to chose from, so it’s more advanced than Samsung’s layer-limited selective focus mode. Up close, you can see the software-refined blur effect isn’t quite perfect on the edges of in-focus subjects (especially around hair), but its blurring imperfections are mostly visible only when you zoom in. It’s a neat effect, and can be applied to any image in Auto mode. You don’t have to constantly switch to a specific selective focus mode to apply these effects, like on some phones. The Honor 8 camera isn’t wanting for other modes. Its Pro mode is full of manual controls for fine-tuning ISO, white balance, aperture and exposure; HDR helps fix overexposed shots, and Light Painting is unique in that it sets you up to capture the light trails of moving cars in the night without you having to tinker with the manual settings. This can be applied to everything from shooting stars to flowing water in order to elegantly capture constantly moving light. The Honor 8's video capabilities surprisingly lack 4K recording and optical image stabilization. Instead you can get 1080p at 60 frames per second and extra modes like Pro Video, Beauty Video and Slow-mo shot in 720p at 120fps. We found the video quality to be average, with shakiness when you're moving in the non-stabilized 1080p 60fps setting. Yes, the Google Pixel and Google Pixel XL cameras lack OIS, too, and favor a similar software-based EIS. But Google’s algorithm for steady photo and video footage is just better. The differences lie in the back-end software. The Honor 8 can take wonderful photos outdoors in daylight and even near sunset. It even does a good job picking up detail and color in low light. A Samsung, LG, iPhone and Motorola will beat it, but it's closer than we expected for a mid-range phone. This photo achieves a high level of detail, even if the skin tones are a little pinker than it was on other phones we tested. Here's where it didn't go well. It overexposed the shot due to the white sweater. It's a great Android phone, but falls victim to all of the old foibles, too. Again, the amount of color it's able to pick up is delicious, I mean, impressive. In this incredibly difficult shot where the shop is dimly lit and the background is backlit, it managed to properly bright up the shop and does capture at least a little bit of the outdoor, sunny environment. It's not the best HDR we've ever seen, but admirable from a mid-range phone. There's more detail in this shot than ever mid-range phones, like the ZTE Axon 7. Note, the environment doesn't have the best lighting, but the dual camera system is able to capture natural looking reds and browns in the foreground. The front-facing camera is meant for selfies, but its beauty mode makes your photos look very alien-like. Embrace the wrinkles by toning it down. Much better all-natural selfies. We still like the Galaxy S7 Edge, but at least this phone skips the barrel distortion that Samsung's newest cameras exhibit. We tested out blocking the second camera (with our finger, which is faintly present in camera one and wholly covering camera two) in order to see if photos looked clearer or more detailed with and without. There's a tiny bit more detail, but it's hardly noticeable without side-by-side comparisons. The Honor 8 ends up being one of the best mid-range camera phones on the market, but it's not leaps and bounds better and doesn't touch what Apple, LG and Samsung are doing right now. The low light camera on the Honor 8 - but it can be hard to get a stable image in a shot like this. Here's a version of the photo above in monochrome, though it's not solely using the monochrome camera like on the Huawei P9. It's just black-and-white after the fact. Huawei phones are almost always a performance mystery before they reach our hands because the company uses its own line of chips – in this case the Hisilicon Kirin 950 processor that’s also at the heart of the Huawei P9. You won’t find the Qualcomm Snapdragon 820 system-on-a-chip here, even though it’s in just about every other major Android smartphone in 2016, including the OnePlus 3 and ZTE Axon 7. The good news is that the octa-core Hisilicon Kirin 950 CPU keeps up with Qualcomm’s all-star chip for the most part, aside from a few hiccups when running high-end graphics in 3D games. We would have liked to see the Honor 8 come with more than 32GB of storage for its entry-level model. If you're in the US there’s a slightly more expensive 64GB configuration to rival the ZTE Axon 7 and OnePlus 3, while Huawei has included a microSD card slot that doubles a nanoSIM card tray. While the ZTE Axon 7 doesn’t reflect light, its dull aluminum build makes it look more expensive than it really is. In truth, it costs the same as the Honor 8. But you get a larger 5.5-inch Quad HD display and double the internal storage, 64GB, with its base model. The dual front-facing speakers and sharper OLED screen make this a better multimedia phone, while the Honor 8 provides a camera that shoots better stills. Both phones are slippery, and cry out for a design-defeating case, but the Axon 7 requires two hands to operate properly. The OnePlus 3 looks completely different from the Honor 8, but it’s very similar in all ways but the design. Yes, it has a larger 5.5-inch AMOLED display, but it’s 1080p and just as sharp as what you’ll get from a Full HD Huawei phone. Like the ZTE Axon 7, its main advantages over the Honor 8 are the 64GB of internal storage and superior software. You get more value out of the OnePlus 3, especially when you consider its bigger screen size, than you do with the fancier-looking and one-hand-friendly Honor 8.